Event details: We live in a society that is confused about death. For most of us, it is something remote, institutionalised, medicated, tidied up and removed from our everyday living. Many of us wonder how to talk about it, how to approach it, how to be with it. Imagine if our own journey of living and dying could support the building of a community that nurtures the wholeness of life in all its seasons. How we might support each other and our children to understand, know, trust and experience death as natural part of life. How might we move beyond the myth of separation, even annihilation, and all the fears fed by that view, to a lived experience of dying as sacred transition? How might we turn towards death with a sense of agency and empowerment? And when we’re called, to drop into the mystery and to trust? In this retreat, co-facilitated by Anne-Marie Hoyne and Helene Fisher, we will explore how we can best respect and support ourselves, and others in and after our dying. And how we might find ways of doing this that reflect and honour what is, and has been most important to us. We will call upon our ancestors to seek their wisdom; we will honour our own present feelings around death and dying; and we’ll explore ways to live the realities and the mysteries with deepened awareness and authority. Event details: A festival for life, death and how we can support each other at end of life. 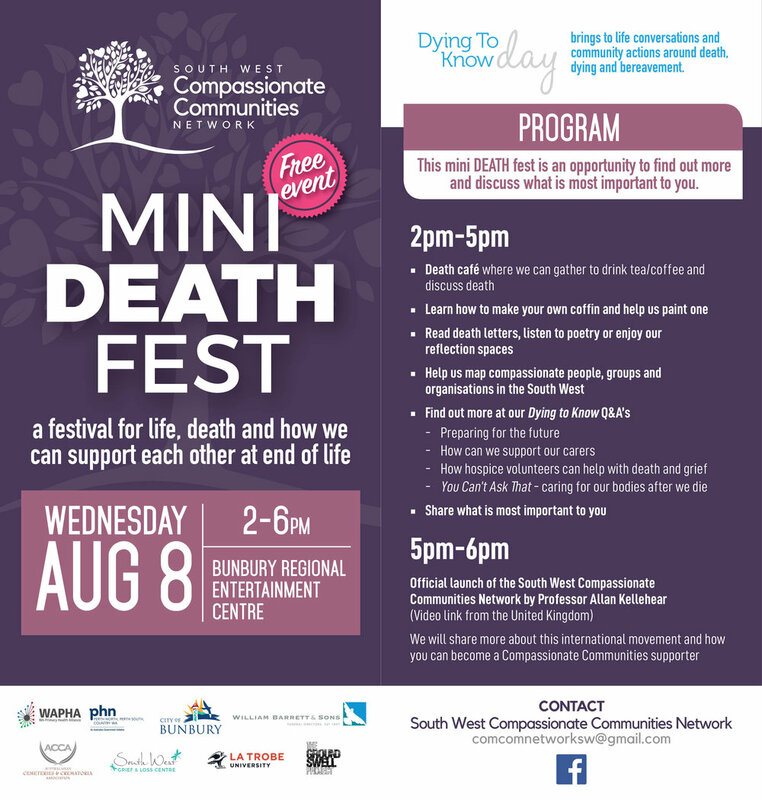 This mini death fest is an opportunity to find out more and discuss what is most important to you. Event details: Four days of events will be launched at FIlm Harvest with the screening of "The Leisure Seeker", starring Helen Mirren and Donald Sutherland as a couple approaching the end of their lives and determined to do it their way. Join their road trip adventure as they tick off their bucket list! Tickets can be purchased from Orana Cinemas. 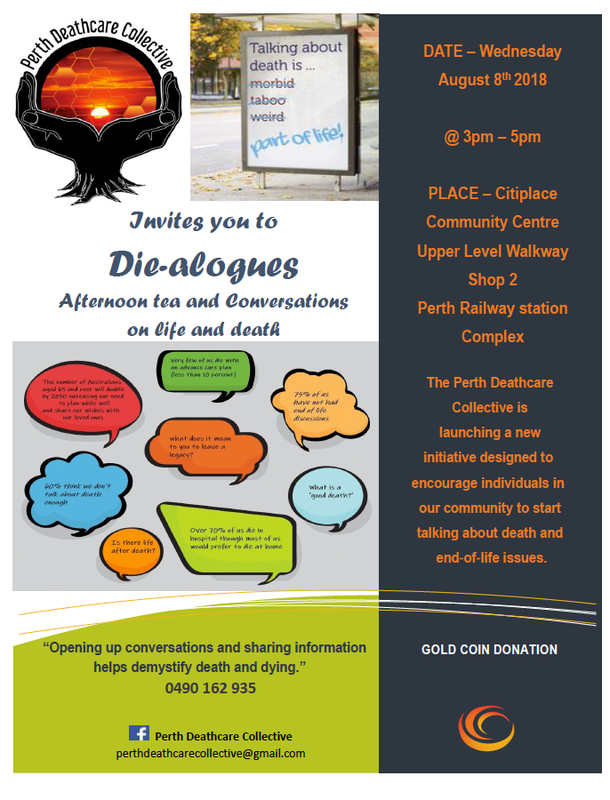 Event details (provide a brief overview of the speakers and/or topics): The Perth Deathcare Collective is launching a new initiative designed to encourage individuals in our community to start taking about death and end of life issues. We invite you to join us for afternoon tea and conversation in the heart of the City. We hold a safe space to explore all topics around life and death and share your thoughts and feelings about death and dying. Opening up conversations and sharing information helps demystify death and dying. The Perth Deathcare Collective was initiated in November 2017. We are a developing collective of likeminded, heart centred practitioners and community change agents of the ‘Positive Deathcare Movement in WA’. Our members are made up of experienced individual’s such as End of Life Practitioners, Death Doula’s, Celebrants, Home Funeral Guides, Counsellors, Conversation Facilitators/Educators, Vigil Guides, Grief Ritual Specialists, Advocates… and much more. Event details: Shane Bailey is an End of Life Doula and local resident who will be available for loan as a "Living Book". Members of the community have the opportunity to ask questions they may have been afraid to ask, or simply have a conversation, around death, dying and grief. Shane is passionate about supporting people to become more literate about death and dying, and supporting people during the end stages of life. Event details: Shane an End of Life Doula will be offering herself as a living book at the Boys Library. Shane invites you to come and have a deadly die-logue over a cup of tea or coffee, to feel free to coffin-up those questions you are dying to ask but never have and share your thoughts and feelings about death and dying. Event details: Death Over Dinner and screening of 'Defining Hope'.